Most of the late night shows took last week off and, look, everyone needs a break. Especially when you’re a political comedian charged with making sense and light of the daily fusillade of foolishness coming from the Trump White House. After seven whole days watching the villainous buffoonery of the Trump administration sitting at home like the rest of his viewers, Meyers took to his nightly “A Closer Look” segment to run through all the comic rage he’d stored up over [checking notes]: Trump’s seemingly self-destructive rage-tweeting about his court-thwarted ”travel ban”; Trump pulling the United States out of the Paris climate agreement (reportedly at least partly in a fit of impotent pique over new French President Emmanuel Macron’s manlier, handsomer handshake); Trump complaining about Democratic obstruction of scores of vital governmental positions for which he hasn’t bothered to nominate anyone; and lots of apparently important golf outings. 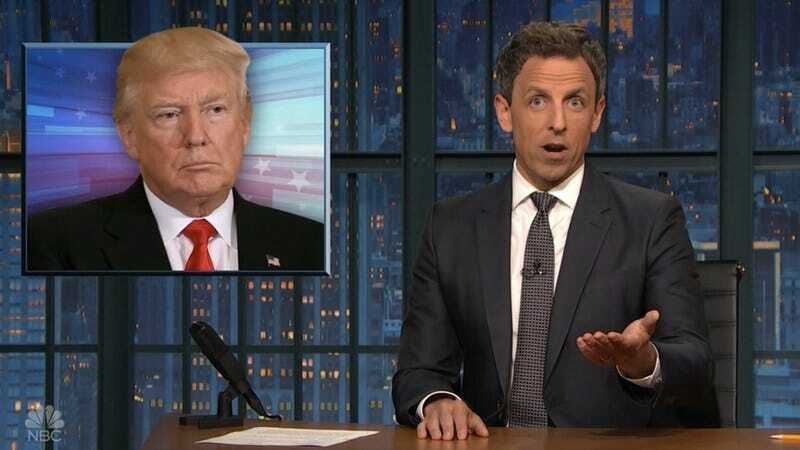 It’s a hell of a backlog, and, as Meyers soldiered on, he repeatedly noted that, for viewers and late night hosts alike, rationing the attendant, incessant outrage can be the biggest challenge of all. Noting London Mayor Sadiq Khan’s unwillingness to respond to Trump’s inconceivably insensitive Twitter hectoring, where a spokesperson explained “We have more important things to do right now,” Meyers commiserated, in that “responding to Trump’s ill-advised tweets is a full time job.” In fact, as he noted—and the infrequent week off notwithstanding—it’s literally his full-time job.